This Course is designed for both the diver who just wants to extend their bottom time, and for those who are beginning their path towards becoming a Technical Extended Range diver. With one of our experienced instructors you will learn the skills and knowledge required to plan and conduct limited decompression dives to a maximum depth of 40 meters. 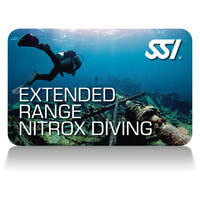 Using nitrox mixtures up to 50%, this course introduces you to Extended Range training techniques and skills. The course can be taught using both a modified standard "single-tank" configuration with deco stage, or a Technical Total Diving System depending on the students future goals.